After reading through the Steve Jobs biography by Walter Isaacson, I learned about various characters that interacted with Steve while at Apple. One of those was Joanne Hoffman, an Eastern European refugee from the original Mac team. She won the unofficial award of best standing up to Steve Jobs in 1981 and 1982, given to her by her colleagues. Steve knew about this award and enjoyed it. 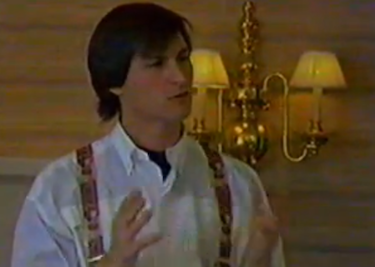 The following video, a great find by The Next Web (plus other vids), will illustrate those reading the Jobs biography. Steve Jobs is at his prime with his ‘reality distortion field’ in full effect, as he suggested at a NeXT meeting they company could create their next product in only 18 months. Hoffman’s ability to speak her mind to Steve is clear at the 11 minute mark. It appears Isaacson used the following video from a series called Entrepreneurs, as a source for the section of the book when Jobs started NeXT. The details are literally spot on. What a cool video of a ‘younger’ Jobs working at NeXT.